Fill out the form with any questions or inquiries you have for the sales consultants at Volterra. You can also call or chat with us for immediate responses. A contemporary take on the Messina home design brings a modern feel with slate tile roofing and multiple color accents. The two-story Messina home is designed with growing families in mind with 5 bedrooms and 3-car garage. Stone veneer on the Messina exterior option B dress up the homes exterior and is complete with front yard landscaping. The 2-story Messina offers a welcoming layout and space for growing families. The kitchen island provides an eat-in bar top for meals on the go, and the soaring gathering room is ideal for entertaining. Thoughtful living spaces include a covered patio just off the café, perfect for dining al fresco and providing ample light into the living areas, and a second floor loft (near the additional bedrooms) ideal for a kids’ play room or media room. 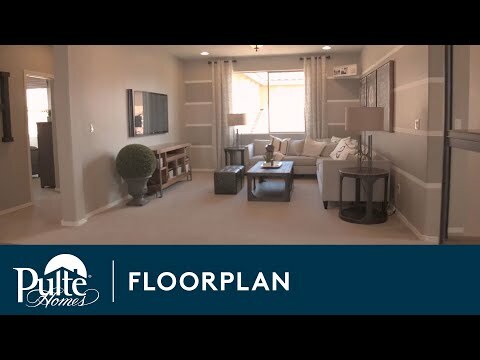 Step inside Messina to see the Life-Tested Home Designs® with more usable space where you want it most. So you live the way you want to live. The Messina is known for its spacious floor plan, perfect for any large or growing family. This two story homes comes with a standard 4-car tandem garage, 9' ceilings on the first floor, a soaring gathering room, and beautiful tile flooring in all wet areas. If you need more living space, add another bedroom and private bath. The Messina features a soaring two-story gathering room adjacent to the kitchen, and extra storage in the 3-car tandem garage. The owner’s suite is situated on the first floor with its own private bathroom.